and as a painter we have been captured." Seth Eastman: Painting the Dakota is a story about art crossing the boundaries of culture and time. In the early nineteenth century, Seth Eastman, an officer for the American army trained in topographical drawing began recording daily Dakota life. He was convinced he was documenting a culture that would soon disappear. He filled his sketchbooks with delicately detailed sketches and watercolors of Indian life; scenes of traditional ceremonies and dances; women gathering wild rice; men hunting muskrat; the courting ritual with a Dakota flute. Seth Eastman: Painting the Dakota wrestles with the questions and complexities that arise when a person documents a culture not their own. This handsome and journalistically objective documentary uses dramatic readings, impressionistic reenactments, original artwork, interviews with art historians and Dakota elders and stunning landscape photography to shed new light on a contested history. 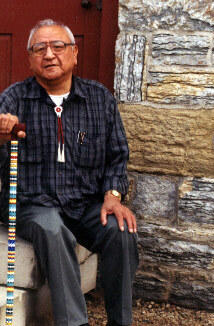 Seth Eastman: Painting the Dakota will air on many PBS stations beginning November 1, 2002.